What's the most cost-effective way to purchase wedding favors? Let's be honest, that is a question that most brides encounter when it is time to buy that special gift for such a momentous occasion. Once the couple becomes informed of the styles and the market, a solution and a smart choice can be made. The purpose of this article is for the couple to emphasize on what is important to them, and to find the right favor for the wedding. Highlight (or number) what is most significant, and utilize the convenient worksheets to make it materialize. Staying attuned and focused can make this a fairly easy task. What is a meaningful gift for the wedding guests? Generating ideas can be clear by researching the theme, customs, or flowers that are involved in the wedding planning to date. A wedding favor is an old tradition in which small gifts are given as a gesture of appreciation or gratitude from the bride and groom at the wedding reception. Classic favors can range from chocolate or sugared almonds to scented soaps or candles. More modern favors can be photos frames, music CD's, and personalized gifts. A custom that has lasted for centuries has developed into endless choices of favors. Jordan Almonds has a variety of meanings and sentiments. White almonds signify weddings. They are usually given in odd numbers of three or five. Three almonds symbolize health, wealth, and happiness. Five almonds represent health, wealth, happiness, fertility, and longevity. Or five almonds may also symbolize health, wealth, happiness, and one for a boy and a girl. White Calla Lilies means "magnificent beauty", but has also been symbolic for purity, innocence, truth, holiness, faith, and devotion. Dressed in white, with a bell-shaped gown, the bride is the essence of a white calla lily. With such a strong symbolic meaning, it is clearly understandable that calla lily wedding is so popular. Something Old, Something New, Something Borrowed, Something Blue has been a custom that has been honored by brides for centuries. It is supposed to be good luck for the bride to wear these items. And on her big day, it is also an opportunity for her to acknowledge a few wonderful people in her life. A favor based on a time-honored tradition would be memorable. How much should you spend on wedding favors? Budget for wedding favors is a vague subject, and varies upon what content is read. Here is a couple of suggestions, and pick which one works for your budget. If your wedding favors are considered your gift expenses, then 2-3 percent should be allocated to favors. This budget will also include bridal party gifts, parents' gifts, and gifts to each other (if exchanging). If your wedding favors are considered the reception expense, the part of the 35% should be allocated to favors. This budget will also include reception site cost, meals, liquor, bartender expenses, gratuity, centerpieces, linen, and parking fees. Consider this: You spend $80 per person for an all inclusive reception. If you allocate 6% (like a sales tax) per person, you would then have $4.80 to spend on each favor per guest. It is that simple. Set your percentage to per person. Just set a limit by per person or by total. Stay within your budget, and try not to go over. A reminder for when you look for favors online: Most favors go down in price with the more you purchase. So looking at a more expensive favors could still be within your budget depending on the quantity. How to make wedding favors? There is more sentiment placed in wedding favors that you make for your wedding. There are endless and countless ideas available, and can be cost effective. Some of the most popular include: candy in an organza bag; candy filled favor boxes; personal CDs; and poems from the bride and groom. A couple of words of wisdom before making homemade favors. First, make sure that the time is available to get this done before the big day. Second, if you are buying any materials with the word "wedding" on it, then it is probably going to cost more money (ie. Wedding tags vs baby shower tags). And lastly, be careful to watch your cost for materials. The materials start to add up very quickly, and in the end, you could buy favors for the same amount. Is the wedding casual or elegant? Is the wedding sentimental or light-hearted? What is the color scheme of the wedding? Are there eco-friendly wedding favors? Having an earth friendly wedding does not mean that style has to be sacrificed. Small topiary, flower seeds, tree seeds, and green materials are becoming more popular. Should favors be personalized? Personalization is available on many favors, whether it is wedding tags, stickers, or ribbon. The couples names and date of the wedding are placed on the favor to make it more special. Other items at the reception can be personalized as well, like the napkins or matchbooks. Can practical favors be for weddings? Practical favors are best when considering both men and women. Considering the age and genders of all of the guests, can be important when buying favors. It is a favor that will suit any guests' style, and may be useful in their home. Favorite practical favors include wine favors, photo frames, place card holders, bookmarks, and candle favors. Considering chocolate or candy favors? A sweet treat at a reception will definitely satisfy most guests. There is an assortment of favor boxes and ideas available for candy favors. Remember the time of year that you are having your reception. During a summer wedding, allow for appropriate storage and handling during transport to the reception. If the summer wedding is outside, it is recommended to give the favors at the end of the reception. Wedding favors should be bought about 2-3 months before the wedding. Usually about 20% of guests will decline, so that will be helpful before buying your favors. Styles for favors can quickly change, so if there is a design that is most desired, then it may be best to buy it sooner. 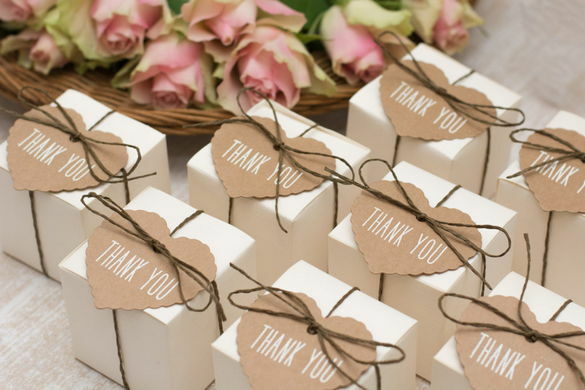 A majority of wedding favors are found online, and in retail stores. Choose your favorite, and start to comparative shop. The convenient worksheets with this article will help you with this process. Look for coupons or free shipping before purchasing, because this can save on the budget. Wedding favors do not have to be overwhelmingly expensive. Time into research is the key to be pleased and satisfied with the wedding favors for the big day.